Today at St. Mary's Oratory in Wausau, Canon Heitor Matheus of the Institute of Christ the King preached the following sermon for the Feast of the Most Precious Blood of Our Lord Jesus Christ. NLM is grateful to him for sharing the text. Today's feast is a marvelous example of how the liturgy expands over the centuries to ponder more deeply and enter more fully into the mysteries of God. 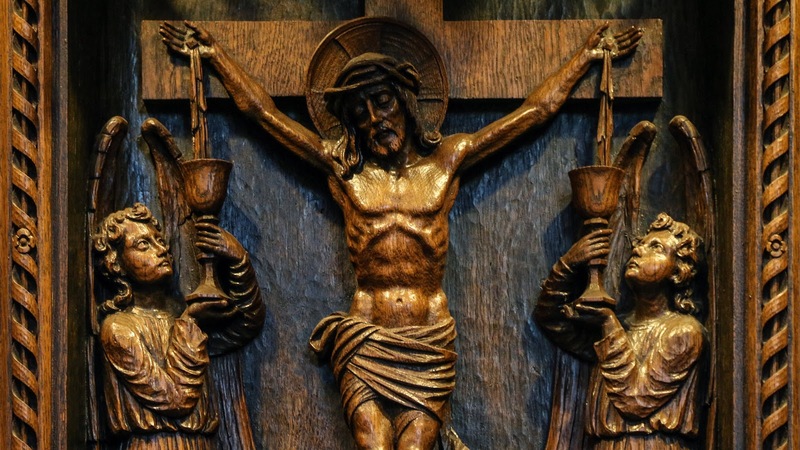 First, from ancient times, there was Maundy Thursday; then in the Middle Ages, Corpus Christi; then when the love of men had grown cold under Jansenism, the Sacred Heart; and finally, in the revolutionary Europe of the mid-19th century, the Precious Blood. Each of these feasts draws out a further dimension of the inexhaustible love of the Redeemer whose victory is greater than the forces of darkness arrayed against Him. Each feast makes present to us the reality and power of the particular mystery commemorated. On the night before His most sorrowful Passion, Our Lord gathered His apostles around Him. On that night, the last night of His mortal life, Our Lord Jesus Christ, as a father, called His children in order to make known His “Last Will.” Every word, every gesture here is full of importance. Through these words, through these gestures, Our Lord gave His own Body and Blood to His apostles. In His poverty, Jesus Christ did not have anything to give but Himself. And that’s what He left for His children: the treasure of His Real Presence in the most Holy Eucharist. Do this in commemoration of Me. By these words, Our Lord gave His apostles the power to do what He Himself had done: to change the bread and the wine into His own Body and Blood. By these words, the apostles were ordained Priests of the New Law, in order to offer the Sacrifice of the New Law. “Do this in commemoration of Me,” which means, offer this Sacrifice of my Body and Blood for the glory of God and for the salvation of souls. So, priests are the executors of the “Last Will” of Jesus Christ. And His last will was that His apostles, and their successors, would do what He Himself did on that blessed night… that the Church would carry on this mystery, until the end of time. 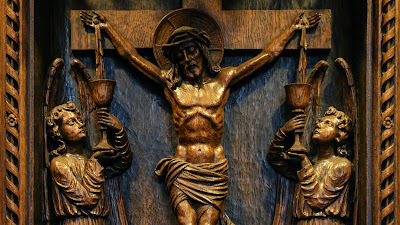 This Feast we celebrate today gives us the opportunity to reflect on the fact that the Blood that Our Lord shed on the Cross for our Salvation is really present on the Altar. After the Consecration, the Chalice doesn’t have wine anymore, but Blood. The Precious Blood of the Lamb of God, which was sacrificed for us. It is not a fable, or a pious imagination, like the Protestants would say. It is not a figure, but it is the reality. If you wish, you can go and ask Our Lord Himself: Lord, what is inside that Chalice? And He will say, as He said on that blessed night: It is my Blood. So how could someone dare to doubt the word of God? So many miracles during the centuries have attested the Real Presence of Our Lord in the most Holy Eucharist! What an infinite treasure Our Lord left to His Church: His own Body and Blood really present among us! From the very beginning, the Holy Church received this precious treasure with reverence and love. And she surrounded the sacred words of the Consecration with many prayers and ceremonies: everything to render glory to the Real Presence of Our Lord. This monument of piety that we call the Liturgy is the most valuable patrimony of the Church. Saint Paul says that Christ showed His love for the Church by dying for her. And we could say, without any hesitation, that the Church shows her love for Christ through the Liturgy, because the Liturgy is the great chant of love that the Church sings to God. It is not so surprising that the enemy would try to attack the Liturgy of the Church, that he would push for a reform, in order to deform this most beautiful Chant. Because the devil knows very well that the Liturgy is linked to the Faith. When you touch the Liturgy, you touch the Faith. When you change the way people pray, you change the way they believe. And when you change the way people believe, you change the way they behave. As Cardinal Burke said: “The abuses in the Liturgy are strictly correlated with lack of faith and moral corruption.” These are the consequences of bad liturgy. And the way to discern a good liturgy from a bad one is the manner the Blessed Sacrament is treated. If the Body of Our Lord is treated like a mere wafer, and if the Chalice of His Blood is treated like a glass of wine, we can clearly see how this way of doing things will deform the faith of the people, who will be inclined not to believe anymore in the Real Presence of Our Lord. And this deformed faith will lead to a deformed life. Perhaps this is the key to understand all the crisis we have been going through in the Church and in the world: a lack of care toward the Liturgy. How has the Liturgy been celebrated? How have people been treating the most holy Eucharist? If the angels could cry, they would, seeing what we see in so many churches nowadays. What we need to understand is that if we believe it is the Lord, we must treat Him accordingly, with all respect and love. So we can see how important it is that the Liturgy of the Church should be well celebrated, for the glorification of God and the salvation of souls. If the downfall of a person, of a family, or a society comes from the lack of care and respect towards the things of God, the restoration of all things will only happen when we learn how to give God the adoration He deserves—when we learn how to honor, with due respect, the Body and Blood of Jesus Christ. So my brethren, let us adore the Real Presence of Our Lord in the Most Holy Sacrament; and in a spirit of reparation for so many abuses, let us say many times during the day the prayer that the Angel of Portugal taught the three children at Fatima: My God, I believe, I adore, I hope, and I love Thee, and I ask pardon for all those who do not believe, do not adore, do not hope, and do not love Thee.